A UX designer needs many tools to complete the many stages of the UX workflow from research to design to prototype and handoff. If you do your work on a PC, you are probably haunted by the constant mention of Sketch, a popular, streamlined vector graphics editor with countless useful plugins that is quickly becoming an industry standard—but only available on Mac OS. This means that, unless you have an Apple machine, you are left out. But now Adobe is actively working on a proper cross-platform Sketch competitor (and lookalike? ), after years of absence: Adobe XD. Adobe Experience Design CC, or Adobe XD, is a lightweight vector graphics editor and prototyping tool that was announced at Adobe MAX 2015 as Project Comet. The software launched in preview in March 2016 as part of the Creative Cloud, and nowadays it is in beta phase, receiving updates almost every month. When you open Adobe XD, the first impression you’ll have is that the interface is very familiar, both for Sketch users and long time Adobe fans. Adobe departed from the expected Creative Cloud darker buttons and menus, and choose to offer the best of two worlds. Unlike Sketch, you’ll see a set of tools on the left side of the screen, but also the taller layers panel and dynamic properties on the right, as seen on Sketch. It’s a breeze to use, and easy to learn, no matter what tool you used previously. Adobe XD also has a set of unique features like the Repeat Grid, a tool that lets you replicate a group of objects like a Material Design card with variable data and configurable spacing between the copies. In XD, you can create an interactive prototype without needing third-party plugins as you would in Sketch. The Adobe prototyping editor allows designers to visually connect interactive areas to other screens using wires and setting up transitions. With the interactive prototype ready, you can publish and share the prototype, which can be viewed on the web or with the Adobe XD mobile app. XD prototypes, however, don’t have support for gestures or fixed sections like headers yet, something that is possible on InVision and other prototype-only tools that connect with Sketch. In the August 2017 update, Adobe added the Assets panel, a clever way to bring together an interactive style guide with colors, character styles, and symbols. When you change something in the Assets panel, every use of the asset in your artwork follows. Sketch also has color variables, character styles, and symbols, but each one contained in their own panel. Changing the elements in Assets panel changes the entire project. Adobe announced some of the next features to appear on XD on the product blog. One of them extends the Assets feature, allowing the designer to publish the project’s style guide with downloadable fonts, assets, and the colors hexadecimal codes, alongside the interactive prototype and an inspection feature for developer’s survey of elements inside the prototype. This is called the “handoff for developers” and is already possible in Sketch (and Photoshop) using plugins like Zeplin. Another future feature being teased is the real-time collaboration inside XD, something that resembles the collaboration feature present on Google Docs and already available on other UX design tools like Figma. When you see the bigger picture, it becomes clear that Adobe intends to make XD do not only everything that Sketch does as a vector graphics tool but also its plugins, covering the entire UX design workflow. From design to prototyping to handoff, Adobe XD will probably be the definitive UX designer tool, but what about today? Adobe XD is first and foremost for Windows users (who can’t use the macOS-only Sketch) and current Adobe Creative Cloud subscribers (who wouldn’t need to pay more for XD in addition to Photoshop, Illustrator, etc.). There are many UX designers already making the jump, either because they are Creative Cloud subscribers even on macOS, or because they believe XD will be the next standard and are satisfied with the current feature set. If you are an experienced Sketch user, you’ll enjoy an overall better interface, unique XD features, but will also have to deal with the current limitations and lack of plugin support. In any case, give it a try and share your impressions with us! I find the prototyping tools extremely lacking in XD at this stage, so am sticking with Sketch and Flinto for design-to-prototyping for now. My guess is that XD will improve it's features in about 1-2 years, at which point I will probably switch entirely to XD and dump Sketch and Flinto - because I would prefer to both design and prototype within one tool. XD is still in beta and thus deserves some leeway on direct comparison. I've found that it makes the prototyping process fun again (instead of the convoluted sketch or photoshop > invision workflow. That said we are giving figma ( https://www.figma.com/ ) a whirl on my next project for the collaboration tools specifically - meaning allowing our BAs to actually edit the prototype in the browser with our clients which feels like the future of these types of tools. I am excited about XD and proliferation of all these types of tools for making and creating easier and more democratic. I can't emphasis how Sketch's symbols are way more powerful than XDs. There are symbol swaps, overrides and resizing. Essentially, you can create responsive dynamic components. The upcoming release that will have symbol libraries is also a huge game changer. ITs perfect for creating complex design systems. Its also has pages that hold the artboards so you can design multiple experiences without the clutter. I can go on, but XD is so far behind it will probably never catch up. Its only strength is that its included with CC and its for PC users, but lets be honest... PC? If you're using a PC you're clearly not interested in using the best tools available. I still cannot fathom why they would not include this. Yeas, this is a bit of a letdown, especially because it's one of the most beloved features on Sketch. Thank you for your comment! Thank you for your comment! Sketch is for sure a more polished tool than Adobe XD (it's a beta version, after all), but I think it is already a good option for some people. Using PC is not always the designer's choice, and in some countries, an Apple machine is too expensive. Glad you liked! Try doing a project in XD before you decide, maybe the limitations are too much, maybe not. Yes, prototyping in XD is very basic, but in my projects, it's been enough for now (and it will surely improve with time). Thank you for your comment! Sadly there is no handoff feature currently - the Assets panel is just the first step. I'm looking forward to it too. Thank you for your comment! I agree with you, I'm not a fan of the need to use multiple apps and plug-ins for a task. Figma is very interesting, the responsive layout feature made me want to give it a try. Thank you for your comment! I'd def recommend Adobe XD for Windows users, but overall, its a few days late and dollar short. For Mac users, its impossible to give up Sketch if you've been using it a year prior to XD. Also, no way would I ever again trust Adobe by building my entire workflow on their product, only to see it get sunset because of lack of market adoption. I was born and raised on Adobe Fireworks, so I've got those scars. I've cut the cord on Adobe, full-time on Sketch, not looking back. But Adobe XD is an easy to use product, its just a bit late in the game in my opinion and lacks on too many needed features for power users. I agree it is definitely late, and should take a while to have a similar feature set as Sketch. RIP Fireworks :/ Thanks for your comment! Its not even a started for us, unless Adobe gets sensible and make it viable to buy rather than rent! Do not want to entrust our IP to products we have to rent, just too risky (and expensive)! Sketch. With Craft. It's totally integrated. Thank you for the great article Sérgio. I've started my carreer with Photoshop somewhere in 1999. I believe it was 5 or 5.5. After working with it for 10 years and purchasing multiple versions, I discovered Sketch. It showed me not only how much I was spending on Photoshop, but how cluttered the workflow and tools where. I was invited to the Commet beta. Since then a bunch of great features have been added. As you can see in the comments, Sketch really found a place in the hearts of digital designers. Perhaps I'll give Adobe XD another try ij a year or two. For now, I thank the people from Sketch (hello country mates!) every night before going to bed. I am a Mac user and i have tried both apps. Even though Sketch has a rich ecosystem, XD's improvements and updates are on the right direction. 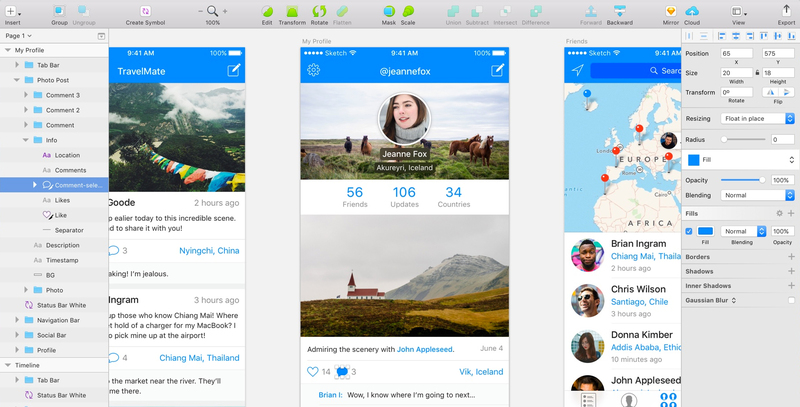 XD's UX is better than Sketch (the tools are all over the place). XD's prototyping is just enough, and i love its prototype recording feature. I love Sketch but I think XD on a long term have the potential do become de leading UX tool. I really enjoy using it and prototyping is great. One thing to mention is that you cannot use Sketch un multiple computers (work, home) but with Adobe XD you can. That's the main reason I'm using it right now. Nice review! I'm working on project with more than 40 pages and performance of Sketch was not being good. I need to break project in 9 files to be more light to work. I did not try XD yet, but this is important question. Performance for big projects. "If you're using a PC you're clearly not interested in using the best tools available." Really dude? I could come up with several reasons why the opposite would be true in the context of design, motion, editing, 3D, etc. I hope you aren't one of these "my MacBook Pro makes me a better designer" type of people. Clearly, if one thinks like this, they aren't really interested in design, rather the aesthetic of the tool. I use both platforms and have for decades. Both work well because I know my craft and how to get the most out of each tool. I'm the pro, not the machine, and my clients could give two on what my tools look like. The only time I run into an issue is when a company snobs out and only releases their products on one platform, (this goes both ways) which in 2017 is a failed business strategy imho. This is where Adobe XD is going to stomp out Sketch in 1 to 2 years from now. Cross-platform applications open up pipelines and debunk platform myths such as the one you shared. And this is rich, because it equates to one less design snob and companies that cater to them. Hi Sergio, thats a good point, one can take for granted that its not always the designers choice on what to work on especially outside of the US. We’re workinv on layout grids right now - won’t be long before it’s available. Performance and quality are top priorities for the XD team - you should be able to have 100s of artboards in a single XD document without performance issues. We are working on developer handoff tools right now and they should be available soon. If you’re interested, we have a prerelease program running to get feedback. Tweet me @ashorten. Figma all the way for me. It’s has almost everything sketch capable of and lots of useful features sketch doesn’t. As for XD, I can see it usefulness for prototype wireframes but as a design tool it’s far too limited for my team to take it seriously. Plus Figma release schedule is so rapid it puts the XD’s team to shame. Excellent review, Sergio! Greetings from UFPR! The problem is that they are Web based. In a place like India where the internet speeds are too slow we cannot expect everyone to be online everytime. That's what I doing now. Using both apps and in my opinion each one have your particularity. I also like the recording feature (that's only works in mac). I like to compare these apps with a airplane. Sketck seems like a jet war fighter with a lot of controls and possibilities and XD is a comercial single seat airplane, eventhough the differences, both can fly. I think that XD have a great team behind of it and we can try new features soon. Have anyone committed their team to UX-Pin? Is it a contender? Thank you for your comment! XD performance is very good, it's problably the snappier tool made by Adobe in my experience. Yes, this is amazing! Not everyone can buy a Mac. Thanks for your comment! This is an important concern. Adobe didn't announce the licensing or pricing for XD specifically yet, maybe they follow Sketch's model. Thanks for your comment! It seems very good and complete, I'll give it a try! Thanks for your comment! Thanks! I miss UFPR days! It being web based is good and bad at the same time. Good because it is OS-independent, bad because of things like Viknesh mentioned. But Figma is a really good tool! Thanks for your comment! Yes, it being an Adobe software gives it an enormous potential. Let's see how the development turns out. Thanks for your comment! I agree with both of you, and I also like XD's UX more. Thanks for your comment! It's really incredible how the design tools have evolved over time. When we thought Photoshop could do everything, Sketch comes to show how to make the life of UX designers easier. Now we have XD, and I'm excited for how it'll evolve and what's comes next! Thanks for your comment! This combination is really good. Almost unbeatable! Thanks for your comment! Good article and I think fair comparison too. I've been using Sketch for 3 years now. Great tool, easy to adapt except few frustrations when you move from Photoshop / Illustrator habits. I also tried XD when it just came out in fact gave few suggestions in the forum back in those early days. The only reason for me not to adapt it properly was no collaboration tools available (until now) even there is no integrations available with other tools like Zepline. It's frustrating to share the individual assets with development team especially after using tools like Zepline. XD is missing basic features: - text underline - making a dashed line (seriously?) - pages (cannot group artboards) - unlimited space (number of artboards you can add is limited) - simple image editing stuff (like saturation) - developer hand-off ("it's coming" for a year...) And development is seriously slow. If XD is a comet, Sketch is flying past it at light-speed. We need good competition (especially on Windows), but it doesn't feel Adobe is bringing its A-game. I was a huge Fireworks user and it was my bread and butter for years. I was horrified when it was killed off out of ignorance. That betrayal has made me very wary. Sketch is only for vector-based UIs, particularly the flat style in vogue these days for phones - although one could argue that in this age of screens everywhere, resizable UI elements will be the norm from now on. The plugin infrastructure is their trump card. If you have a particular project dependent on some difficult area where the app hasn't been applied, one of those can be a godsend. It would be smart if Bohemian coding got a team together to do a Windows version. If that worked, and interoperated with Mac teams (particularly in areas like the shared Libraries and some key plugins), then I think they'd come out on top. I don't find the Adobe licensing scheme to be better, particularly for an individual consultant/freelancer. Perhaps Bohemian can undercut Adobe here as well, by offering more flexible policies for smaller/1 person shops. @sergioestrella:disqus Hi am a graphic designer and wanted to be a UI/UX designer am confused which tool is good for me and help me to boost my future but so many ux designers here in INDIA told me to practice in SKETCH but its not available in Windows version so please suggest me a alternative to this. Eagerly waiting for your reply. Thank You. There are a few simple elements that XD doesn't have that is stopping me from switching at the moment. They seem to have launched the flashy elements without some of the basics (repeat grid, assets panel are great elements). - No guides or rulers - No vector ends of joins options (like in illustrator) so even drawing a magnifying glass with a rounded end is too complicated - Gradient options (nothing other than linear) - Very basic prototyping (can't animate a sticky menu or layers like you can with Invision) - Layer/group labelling (when a company already own Photshop and Illustrator this should be a no brainer) - Handoff to coders was an issue but glad that's being resolved with Publish Design Specs - Ability to pull copy, menus and other material from pre existing websites (Craft plugin does all of this) - Connection to stock image sites etc inside program (Craft plugin again) I'm sure there are more but haven't found them yet. Sketch has always been quite clunky and love how good the performance is on XD. I'd love to switch over to XD but just don't feel it's there yet. Prototyping and designing in the same tool, one click distant one from another, is huge time saver. In Adobe XD you can even edit in prototype mode, so it's question of seconds when you, during testing, realise that something needs to be edited. Yes, it's lacking some features, like fixed, overlay and animated elements but looks like that's in production pipeline at this moment. I'm still using Invision to showcase some particular elements behaviour, but Adobe XD is my tool for the entire navigation prototyping, especially because now it has specs export for developers, including flows. Still lots to improve, though. Sketch is hands-down a superior bit of kit compared to Adobe XD. However, everything has it's pros and cons. XD isn't open to 3rd party plug-ins, which until recently had been Sketch's main thumbs-up, but unfortunately, the main 3rd party plug-in and a VERY key piece of interaction is with InVision, which recently has HUGELY taken it's eye off the plug-in ball as it develops it's own Studio software. On the surface, Studio looks like the complete darts, responsive prototyping etc, however, the bugs in existing software have been rendering them almost unusable, if not actually unusable, as they focus on the premier Studio release. PDF importing is now gone and the Craft plug-in bugs are crashing Sketch left, right and centre. Bohemian need to move politically as far aware from InVision as possible. All aspects that I've encountered with InVision, from Craft to JIRA plug-ins have fallen MILES short of their considerable vision. Right now, OffVision might be a better name for the company. Avoid. I don't think sketch played itself, it seems very likely having the program be mac only was part of the plan. They probably made a deal with apple to make the software and entice designers to switch or stay with apple. Looks like this is about to turn into another stupid "East Coast vs West Coast" / "Walmart vs Target" / "Mac vs PC" / "Democrat vs Republican" debates. SInce version 49 Sketch has native prototyping tool as well. I started using XD when it first released on Beta, and just tried Sketch for the first time today. Couldn't get along with it. It felt so much more fiddly, cluttered and slower to use. Also I noticed a significant drag on cursor/trackpad movement, which was frustrating. With XD, things flow so much easier and all the major tools and settings are so much quicker to locate, click and work with. Just uninstalled Sketch. Hello again, XD. I'm sorry I doubted you. I'll buy you an ice cream. It sounds a bit like you're letting an old grudge help you back from exploring new possibilities. How did you find using XD when you compared it to Sketch? Please just mimic photoshop's guide layout feature, its great. Because we all know Apple cares about designers still. I’ve used FireWorks, then Adobe XD and now Sketch. The plugin ecosystem of Sketch will always deliver more variety more quickly than a proprietary model. Adobe don’t have that ecosystem and in my opinion, never will. Sketch has a vibrant market providing extra functionality and for that reason alone it should be a more sustainable business model. That’s why I chose Sketch. Are you planning to update this post? Now Adobe XD is free, so I think it can be a big blow to Sketch. Ditto on Sketch and Flinto... I wish they would just merge products! Invision Studio is another up and coming all-in-one UI/UX/IxD tool that appears to be very promising after messing around with it during early release. It has too many bugs currently for me to use for actual projects yet and I can't get updates to work so I am sticking with Sketch and Flinto for now. Craft (also by Invision) is an amazing plugin for Sketch that allows for repeat grids, images, text, publishing to Invision and many more features to help streamline the process considerably. Thanks! I prefer windows because it is easier to use, faster, and cheaper, so I am happy to have Adobe XD. I would try Sketch too whenever they finally release for Windows. But as a designer, I could never work on a Mac. How is the handoff to after effects in XD? My sentiments as well, XD's feature set maybe significantly behind Sketch, but the fact that it's free and most importantly, cross-platform means that it's only a matter of time before an OS-dependent app like Sketch will be wiped off the map. XD is more future-proof. Yep. And it's not like Sketch can't see the writing on the wall and is helpless to hold on to their success. They could do a Windows/Linux build, but from all appearances they refuse to. And it's not like people haven't been requesting a cross-platform version. It's not about resources, it's about bias and will. To me, that's just a shortsighted business strategy. Even if the makers of Sketch absolutely hate other OS than OSX, it's about maximum consumer reach, not personal bias preference. Could you imagine the global uproar if Adobe announced it was pulling it's products off of the Windows/Linux/Chrome platforms? Good gracious. That's because it's not there yet. I can conceivably see a 1-2 year development cycle to get it to the point of raw and refined power. There's two major pros when we're talking about XD: It benefits from Adobe's long and experienced community knowledge. It's cross-platform. As soon as XD becomes more mature/refined, it's game over for Sketch. Heya Sergio! Kudos on the informative post! I'm hoping for an update. I've been a full stack designer/developer and creative director for most of my career but design is really what I love doing. Since I have a strong background in business, practical art theory, sales, psychology and design I want to focus on just UI and UX design which frankly and oddly pays better than full stack web development at my level. So I got myself a MacBook (I've actually gotten away with designing for over 20 years on PC so the Mac purists out there please get with it. At this stage in the game Apple is nothing more than Prestige Pricing. Cool Factor for pretty design. People like to be seen with expensive ish. That's it!) just because I heard Sketch was the cat's pajamas but only on Mac. I contacted them (July 2018) and was informed Windows version is on it's way but no ETA :-/ BUT now I'm discovering Xd which is currently free, doesn't require getting and installing a bunch of plug-ins, and is in the familiar Adobe platform (God I miss Macromedia..). So what I am wondering, Sergio and all, IS Xd up to snuff yet? I was going to just do a duplicate project in each but I'd like some feedback here if possible too. Things to look out for ... whatever. Thanks a million in advance! p.s. To the fella who mentioned 2Advanced; KUDOS! You made my day! I'm glad whenever I hear our efforts are still remembered by some! That ish was HARD! MAAAAAAD hours went into that.. Still using Fireworks .... Nothing in the market to replace it , especially with 100s of very useful extension out there STILL for fireworks to add SVG support, creating grids of elements etc. Why do we want to do round trips into multiple programs when Fireworks handles all the common bitmap and vector tasks and is great for protyping? Spot on John ...... I wish I had access to the number of Firework users at the time Adobe decided to freeze it... If you look at Fireworks now, with a few tweaks, some new features and updated UI it blows every other UI/UX design tool out of the water by a million miles. Tried Sketch because source files of a client were Sketch files. Also, at that time XD didn't do simple things like underlining text. Up until then I was using Photoshop for UI design. Sketch wasn't bad. I could do most of the things I was used to doing in Photoshop, except for photo editing. No real problems with it until I imported a vector and resized it. Strange things happened to the fine details in the vector. From what I read online it seems to be a known bug in Sketch. The latest version of XD came out and, being on a new project I decided to give it a try. Although I never hated Sketch, using XD was like returning to a warm safe place where shortcuts just work and everything is intuitive. My productivity went through the roof. Way faster than Photoshop, way faster than Sketch, way more intuitive, no need for plugins, so good. Vectors imported and resized without a hitch, export to Zeplin - no problem. Never looked back at Sketch. Agreed! Sketch is starting to become a resource hog and often crashes with larger files. Having to use Craft/Invision and Anima plugins to handle things like auto-layout and prototyping don't help. I'd like to think Adobe can set the standard here, although like other users I'm pissed that they never evolved Fireworks and instead pandered to the designers who were happy in their Photoshop comfort zone. 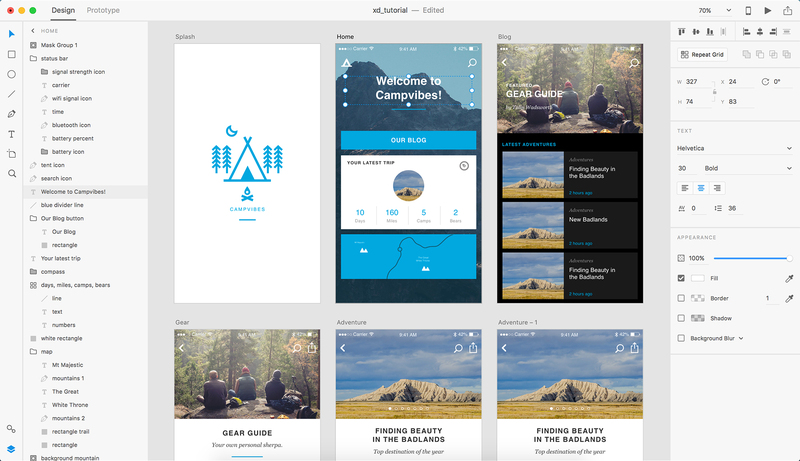 Home › Blog › Adobe XD vs. Sketch – Which UX Tool Is Right for You?